Brady put forth a masterful performance on Thursday night, completing 34-of-44 attempts for his first 300-yard outing of the season with 341 yards. Of his 10 incomplete passes, Brady actually had three dropped passes and two more throwaways, giving him an impressive 88.1% adjusted completion percentage. His grade tops the charts despite two interceptions that were not his fault as he kept a clean sheet without throwing a turnover-worthy pass. Big play after big play after big play helped Crowell rack up 219 yards on the ground on just 15 carries. Coming into the game, he had rushed for 171 yards over the first four weeks of the season, but more than doubled that, setting a season-high with four missed tackles forced, taking his tally for the season to 13 on 57 carries. 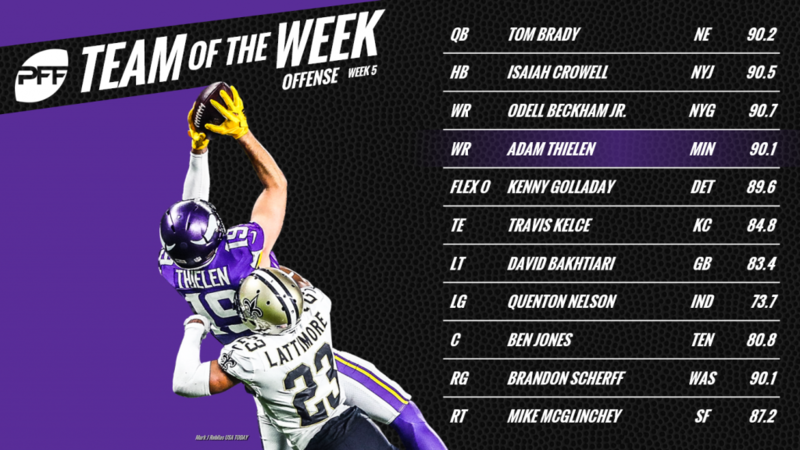 After a day that included a touchdown in double coverage, a one-handed grab and a touchdown pass, there really wasn’t much that could keep Beckham off of our Team of the Week. From 35 snaps on the field as a wide receiver, he averaged 3.74 yards per route run and is forming a playmaking partnership with Saquon Barkley that should have Giants fans excited. Picking up over 100 receiving yards for the fifth straight game to open the season, Thielen was once again masterful for the Vikings in their win over the defending Super Bowl Champion Eagles. Among wide receivers with at least 10 targets this week, his 2.90 yards per route run average ranked fifth. The Chiefs continued their unbeaten start to the season, and Kelce continued to dominate from the tight end position. Picking up 100 receiving yards from 35 snaps on the field as a receiver, Kelce led all tight ends with at least 20 receiving snaps with an average of 2.86 yards per route run. Golladay was targeted nine times in the Lions win over the Packers, the fourth time in five games where he has been targeted at least seven times, and the fifth game in a row this season where he has picked up at least four receptions. He had a ridiculously athletic reception downfield where he then shrugged off the Packers defensive back, once again highlighting his big-play ability. Doing what he does best, Bakhtiari was once again dominant in pass protection in the loss to the Lions. From 62 pass-blocking snaps, he allowed just one hurry, and no sacks or hits. With the flow of the game, his opportunities as a run-blocker were limited but he still produced a solid 67.3 grade in that regard as well. 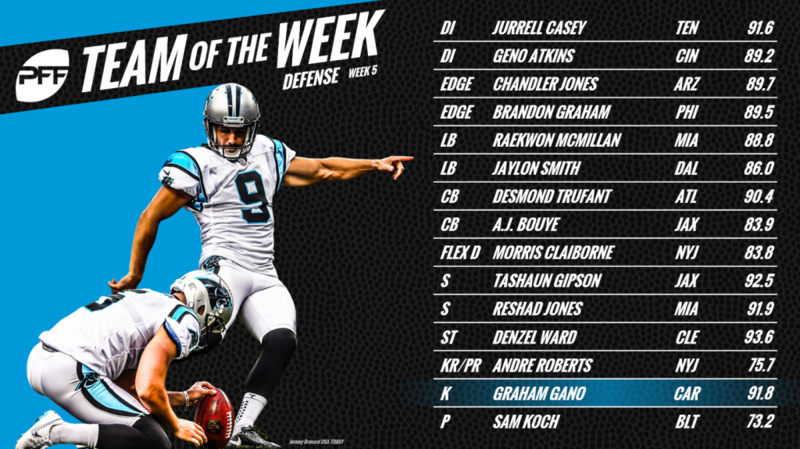 A strange week sees most of our top performances at the guard position come on the right side, but the sixth overall selection in the 2018 NFL Draft makes his first appearance on the PFF Team of the Week with a solid showing on Thursday Night Football. He produced the best PFF overall grade of his career in the loss to the Patriots, allowing a hit and two hurries from 62 pass-blocking snaps. Jones allowed just one hit from 30 pass blocking snaps and produced a 79.9 run-blocking grade, the best mark at the position this week. Jones has had an up and down year so far, but this was the best performance we have seen from him, particularly in the running game. It was a night to forget for Washington, but Scherff reminded everyone of what he’s capable of with an outstanding performance at right guard. From 44 pass blocking snaps, he allowed just one sack, with no hits or hurries. With the flow of the game, they only ran the ball 17 times, but as he has done before, Scherff made several key blocks, both at the line of scrimmage and second level. The second rookie on the offensive line of our Team of the Week this week, McGlinchey had the best game of his career so far despite the loss to the Cardinals. From 64 pass-blocking snaps, he allowed just one hurry, with no sacks or hits, and delivered some nice blocks in the running game on his way to an 86.5 run-blocking grade. Jones was a force of the edge in Sunday’s win over the 49ers, producing a sack, two hits and hurry, along with a forced fumble and a batted pass, on 56 pass-rushing snaps. He impressed against the run as well and finished the game with six total defensive stops. Casey had a quiet day as a pass-rusher, with just one hurry registered from 18 pass-rushing attempts, but he was a monster against the run. From 35 snaps in run defense, he registered six tackles, with five of those tackles resulting in a defensive stop. Atkins continued an impressive start to the 2018 season on Sunday. From 28 pass-rushing snaps, he racked up two sacks, a hit and two hurries, and finished the day with three defensive stops. The Eagles couldn’t get the job done against the Vikings but Graham was dominant off the edge once again. From 35 pass-rushing snaps, he totaled a sack, two hits, four hurries and a batted pass. So far this season, he has registered a sack, three hits and 17 hurries. A second-round draft pick a year ago, McMillan delivered the best game of his career to date in the loss to the Cincinnati Bengals. In coverage, he allowed three receptions, but they totaled just 10 yards, and he impressed against the run, with four of his five tackles on the day resulting in a defensive stop. Smith was impressive against the run, in coverage and chipped in with a sack and a hit as a blitzer in the loss to the Texans. Targeted four times in coverage, he allowed three receptions for 42 yards and had a pass breakup as he finished the game with five tackles resulting in a defensive stop from seven tackles. While the Falcons struggled to hang with the Steelers, Trufant wasn’t at fault for that, with an impressive day in coverage in the loss. Targeted four times in coverage, Trufant didn’t allow a single reception and forced two of those incompletions with pass breakups. A playmaker in coverage, Bouye was at it again against the Jaguars, coming away with an interception and pass breakup. Targeted seven times in coverage, he allowed just four receptions for 32 yards, and allowed a passer rating of 29.2 on throws into his coverage. Gipson saw two plays where he was the primary target in coverage and didn’t allow a single reception. He also had a pass breakup and an interception, finishing the game with a passer rating allowed of 0.0. Jones delivered in coverage for the Dolphins, coming away with two pass breakups and allowing just one reception for negative yards on throws where he was the primary defender in coverage. He was impressive as a tackler also, finishing the game without a missed tackle and four tackles resulting in a defensive stop. Claiborne was targeted nine times on 58 coverage snaps, allowing four receptions for 47 yards. What was particularly impressive though is that he forced plenty of those incompletions himself, with four pass breakups over the course of the game. Could it really be anyone else? Gano was perfect on the day but it was his game-winner that will live in the memory of Panthers fans for quite some time. His 63-yarder won the game as time expired, and looked like it had a few extra yards in it too. The Ravens offense struggled on the road in Cleveland, but Koch was once again at his best, consistently putting the Browns offense in tough starting position. Of his eight punts, seven landed inside the Cleveland 20-yard line. Roberts excelled on punt returners where he produced a PFF punt-return grade of 85.3. This was boosted by 51-yard return and helped him average 17.8 yards per return on the day. Justin Tucker doesn’t miss field goals often unless you block them, and were it not for Denzel Ward’s contribution on Sunday, we might once again be talking about how the Browns kept it close but ultimately came up short. As he has done on defense, Ward made a key contributor on special teams, blocking Justin Tucker’s field goal which ultimately allowed the Browns to win in overtime.